This paper used the same data as the Allentoft et al. 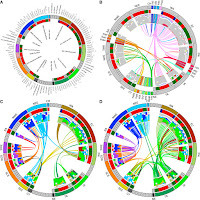 paper, but instead of focusing on the human DNA recovered from ancient Eurasians, it went looking for interesting stuff in the non-human DNA (the stuff that is usually thrown away). 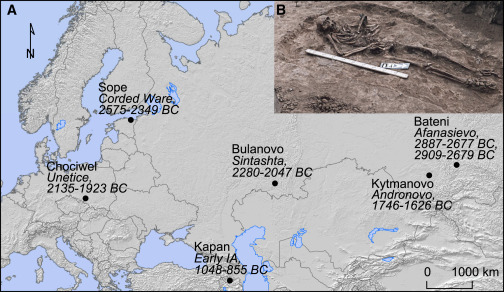 The result: 2,800-5,000 year old Yersinia pestis from Europe to the Altai. It will be cool to look at even older remains than the Bronze Age, but this already pushes the date for plague by a couple thousand years, and implicates steppe people in its earliest spread. Another (? 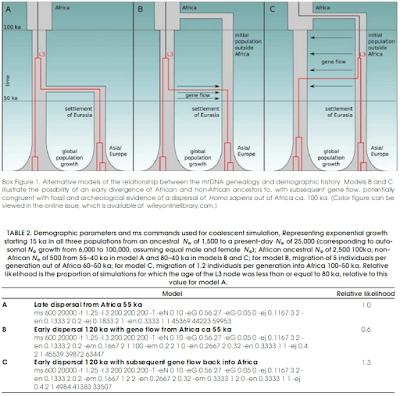 )-worthy paper has just appeared in Nature in the heels of the African ancient genome paper. Time will tell how these worldview-altering discoveries will change the story of Mankind, and a degree of skepticism is warranted. In the view I've held for a few years, modern humans expanded to Arabia before 100 thousand years ago, started leaving it 70 thousand years ago as the ecological situation worsened due to desertification and broke through the "Neandertal barrier" between 70-50 thousand years ago when they developed the skills and technology to overcome them. 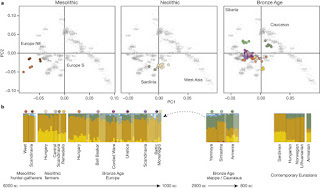 The new paper claims that modern humans were in China 80 thousand years ago and came to Europe much later because Neandertal represented a barrier to successful entry to Europe. This begs the question of how they reached China without encountering Neandertals, as Neandertals were also in West Asia where -presumably- they passed through to get to China. A coastal route to south China would explain away this problem, but the coastal migration is usually envisioned much later, at around 60 thousand years ago. 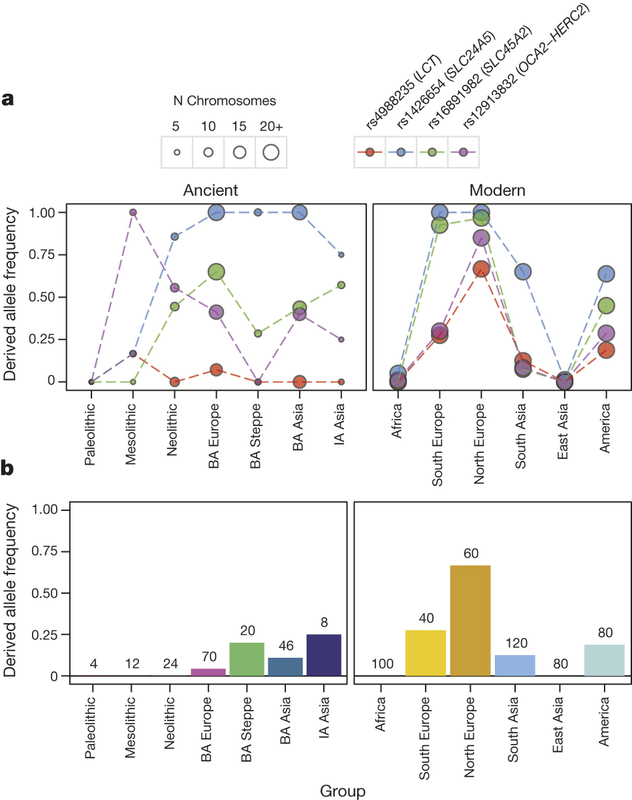 On top of that, how did Chinese end up having equal (or more) levels of Neandertals admixture if modern humans first went to China and later moved west and successfully outcompeted the Neandertals. How were they able to do so eventually? (There is no evidence that the kind of advantages associated with behavioral modernity first emerged in East Asia). 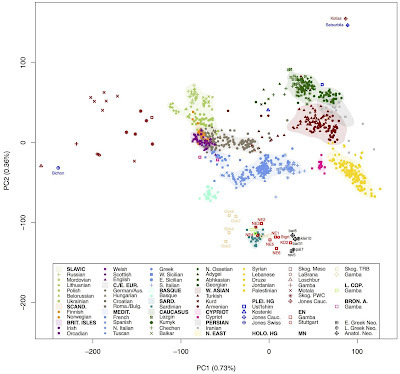 It's possible that there were 80 thousand year-old modern humans in China (just as there were 100 thousand year-old modern humans in Israel), but that the later East Asians are not descended from them. One would think that science would present an increasingly reasonable and consistent picture of the past, but it seems that we're a very long way from the point where the dust settles and the puzzle pieces start falling into place. 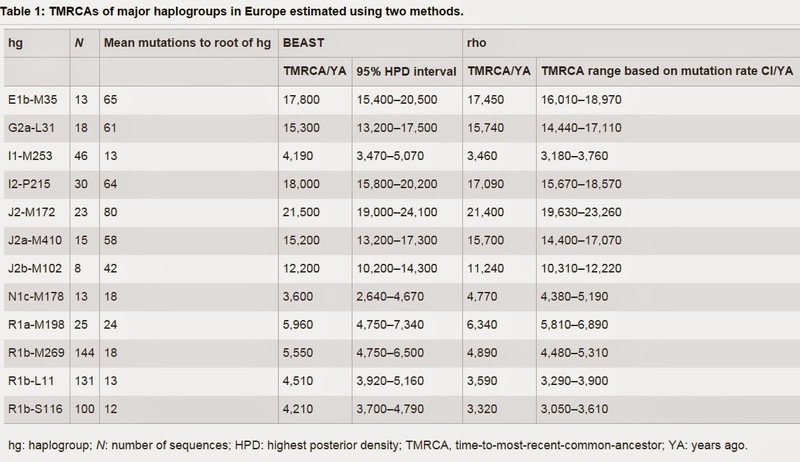 The hominin record from southern Asia for the early Late Pleistocene epoch is scarce. Well-dated and well-preserved fossils older than ~45,000 years that can be unequivocally attributed to Homo sapiens are lacking1, 2, 3, 4. Here we present evidence from the newly excavated Fuyan Cave in Daoxian (southern China). This site has provided 47 human teeth dated to more than 80,000 years old, and with an inferred maximum age of 120,000 years. The morphological and metric assessment of this sample supports its unequivocal assignment to H. sapiens. 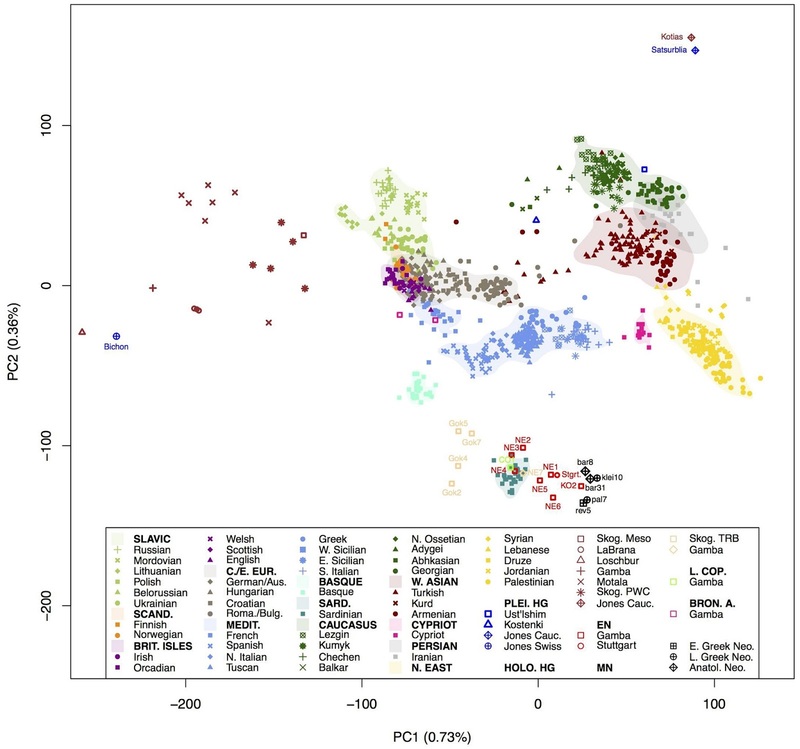 The Daoxian sample is more derived than any other anatomically modern humans, resembling middle-to-late Late Pleistocene specimens and even contemporary humans. Our study shows that fully modern morphologies were present in southern China 30,000–70,000 years earlier than in the Levant and Europe5, 6, 7. Our data fill a chronological and geographical gap that is relevant for understanding when H. sapiens first appeared in southern Asia. The Daoxian teeth also support the hypothesis that during the same period, southern China was inhabited by more derived populations than central and northern China. 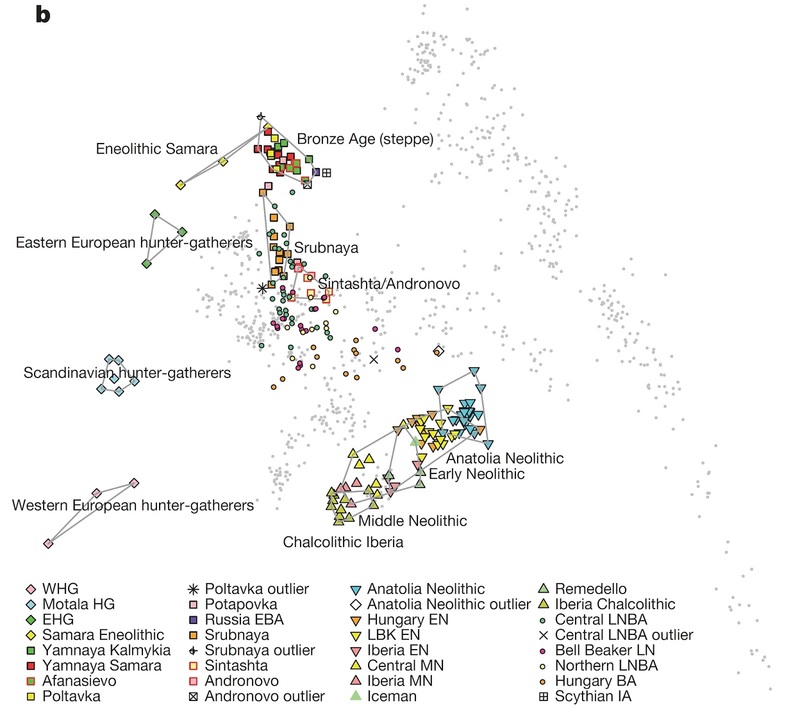 This evidence is important for the study of dispersal routes of modern humans. 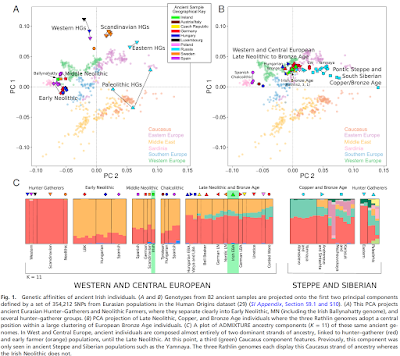 Finally, our results are relevant to exploring the reasons for the relatively late entry of H. sapiens into Europe. Some studies have investigated how the competition with H. sapiens may have caused Neanderthals’ extinction (see ref. 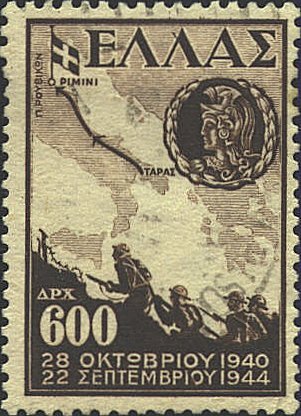 8 and references therein). 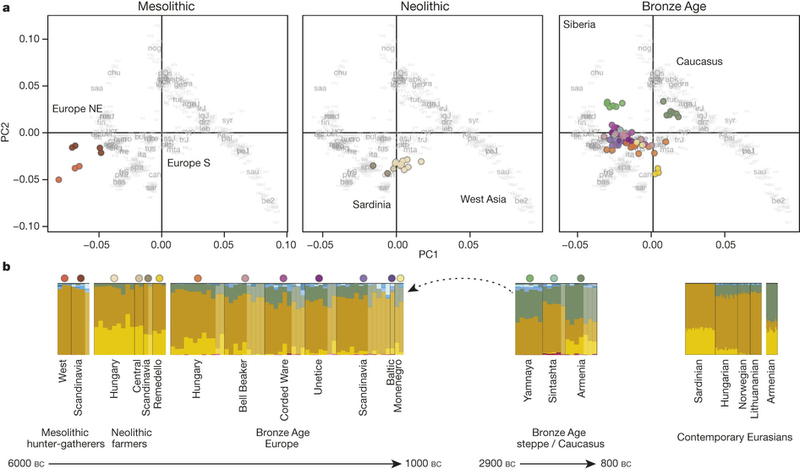 Notably, although fully modern humans were already present in southern China at least as early as ~80,000 years ago, there is no evidence that they entered Europe before ~45,000 years ago. 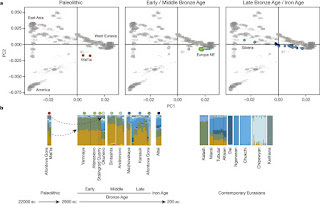 This could indicate that H. neanderthalensis was indeed an additional ecological barrier for modern humans, who could only enter Europe when the demise of Neanderthals had already started. 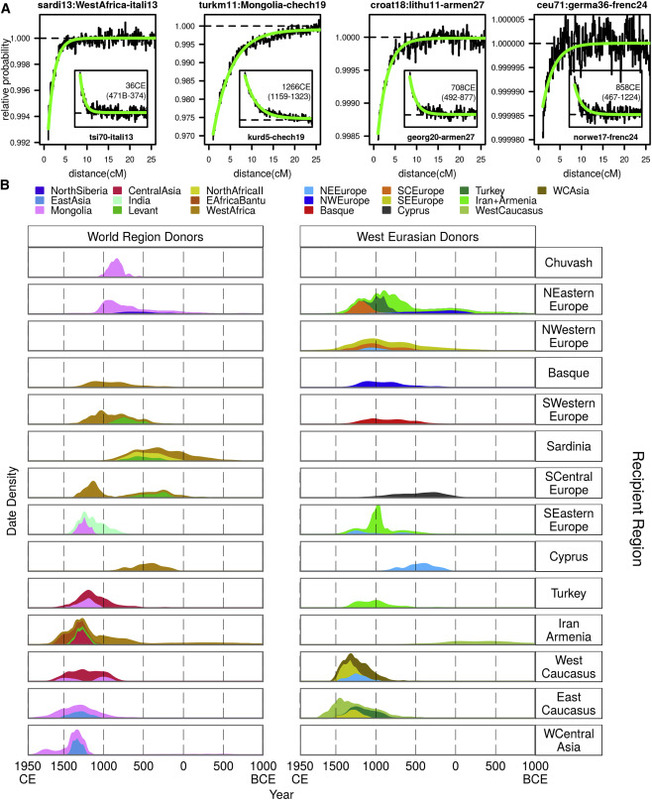 It is no longer tenable to view West Eurasian back-migrations as limited events that affected only North and East Africa: their effects are clearly evident throughout Africa, having affected different populations to a different extent. 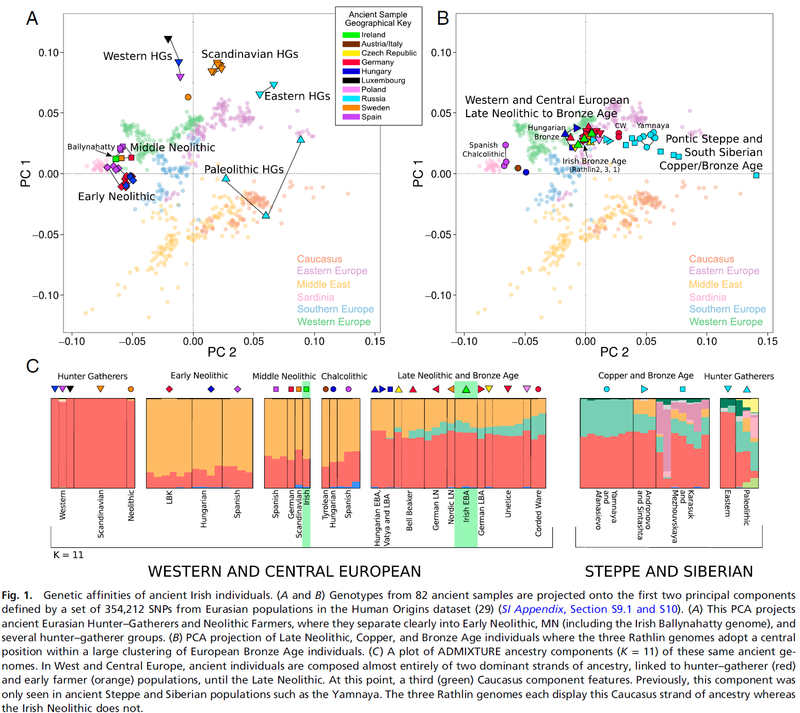 A new paper in Science seems to confirm West Eurasian admixture related to Early Neolithic farmers throughout Africa, including the Yoruba, and Mbuti. I haven't read the paper yet, but it would be a striking discovery if confirmed. UPDATE (1/26/2016). An erratum has now appeared that rejects the claim for Eurasian admixture in all Africans which was the result of the bioinformatic error. I continue to think that there was Eurasian back-migration into Africa, but it was a long shot that this had happened in the last 4,500 years (hence the ? in the title of this entry). 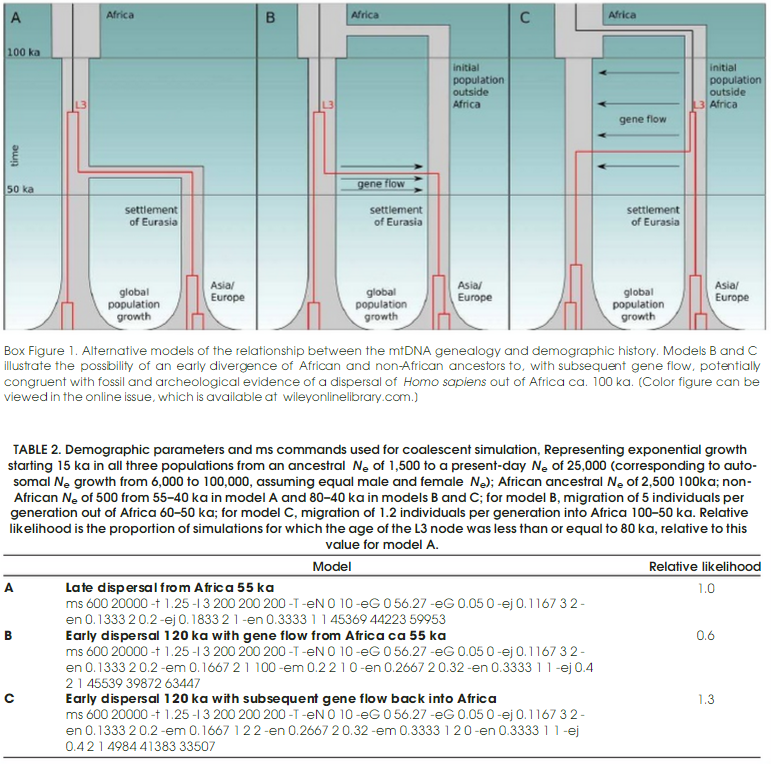 A time series of African DNA may show whether the null model of Sub-Saharan Africans receiving virtually no admixture from Eurasia for the entirety of the existence of H. sapiens can remain valid. I am skeptical that once you remove non-African ancestry from Egyptians (even if you were able to do so perfectly), what you are left with is indigenous Northeastern Africans, the direct descendants of people who left Africa tens of thousands of years ago. For one thing, Egypt has not only experienced gene flow from Europe and the Middle East, but also from elsewhere in Africa, more recently because of enslaved black Africans. For another, even if you perfectly identified and removed both Eurasian and African non-native influences on the Egyptian population, you're left with some kind of indigenous northeastern African. But, did such a population with long-term continuity exist in Egypt since Out-of-Africa? The Eurasian experience (where ancient DNA falsifies continuity left and right even in a 1/10th of the OOA time scale) makes me doubt this. 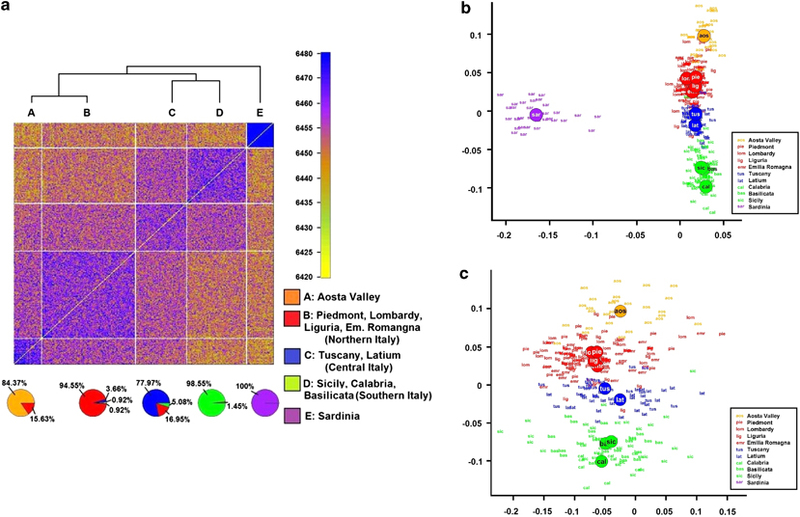 The Nile may have facilitated gene flow in a north-south direction, and the relatively recent emergence of the Sahara desert may very well have pumped populations into Egypt. The time estimates are based on a mutation rate of 1x10-9 mutations/bp/year which is ~1/3 higher than mutation rate of Karmin et al. So the values on the table may be a little lower. 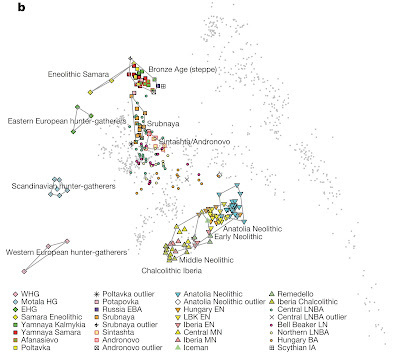 The plots are consistent with patterns seen in the relative numbers of singletons, described above, in that the Saami and Palestinians show markedly different demographic histories compared with the rest, featuring very recent reductions, while the Turks and Greeks show evidence of general expansion, with increased growth rate around 14 KYA. A different pattern is seen in the remaining majority (13/17) of populations, which share remarkably similar histories featuring a minimum effective population size ~2.1–4.2 KYA (considering the 95% confidence intervals (CIs) reported in Supplementary Table 4), followed by expansion to the present. Chiara Batini, Pille Hallast et al. 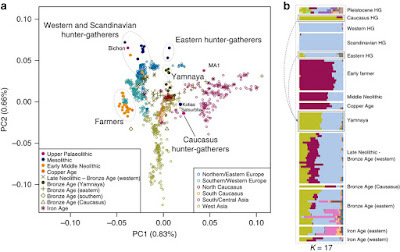 The proportion of Europeans descending from Neolithic farmers ~10 thousand years ago (KYA) or Palaeolithic hunter-gatherers has been much debated. 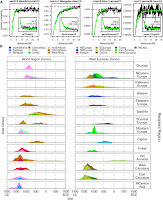 The male-specific region of the Y chromosome (MSY) has been widely applied to this question, but unbiased estimates of diversity and time depth have been lacking. 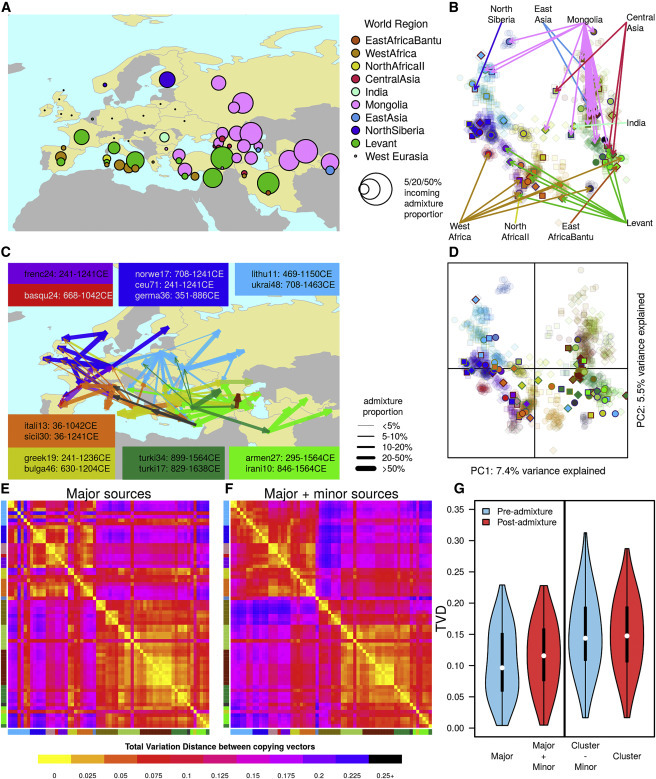 Here we show that European patrilineages underwent a recent continent-wide expansion. 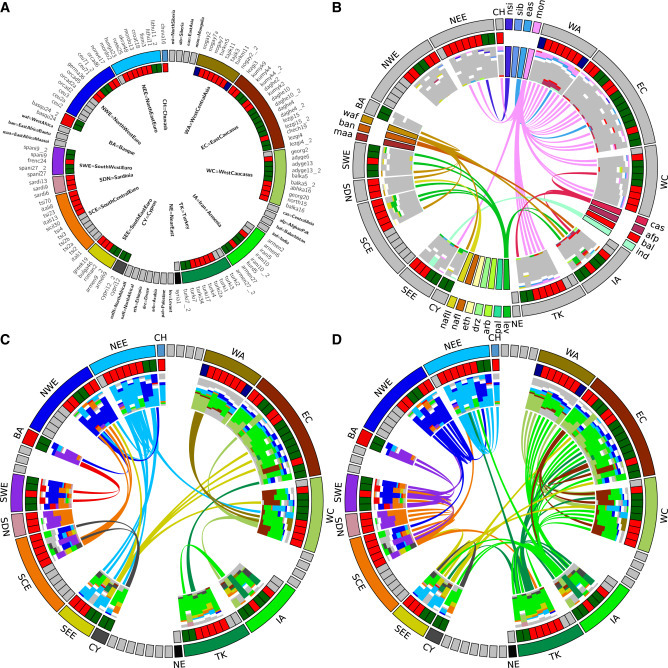 Resequencing of 3.7 Mb of MSY DNA in 334 males, comprising 17 European and Middle Eastern populations, defines a phylogeny containing 5,996 single-nucleotide polymorphisms. 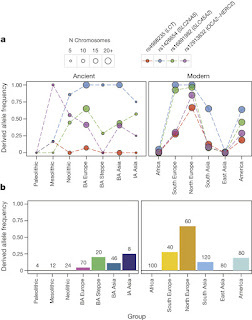 Dating indicates that three major lineages (I1, R1a and R1b), accounting for 64% of our sample, have very recent coalescent times, ranging between 3.5 and 7.3 KYA. 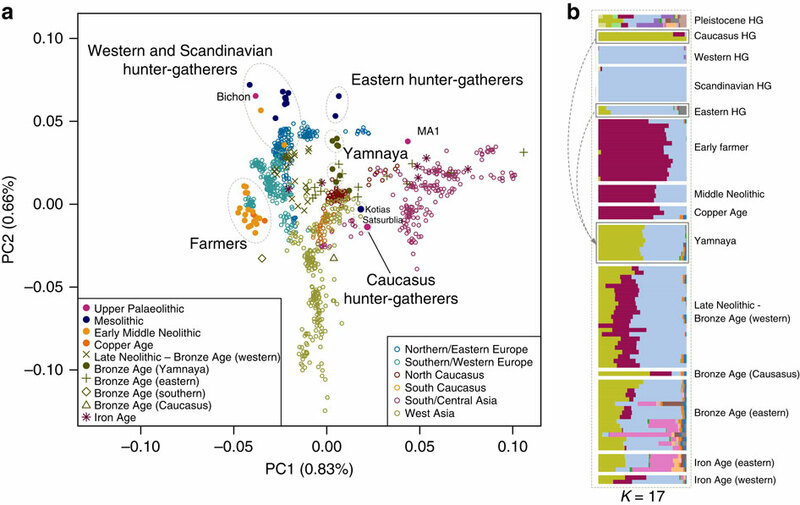 A continuous swathe of 13/17 populations share similar histories featuring a demographic expansion starting ~2.1–4.2 KYA. 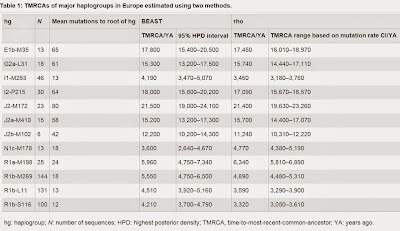 Our results are compatible with ancient MSY DNA data, and contrast with data on mitochondrial DNA, indicating a widespread male-specific phenomenon that focuses interest on the social structure of Bronze Age Europe.